Last week was stressful. Very stressful. And upsetting. My working week did not end well and although I then had a lovely meal out with friends, a fun Saturday in town with my beloved and my siblings-in-law, and a lazy Sunday with lots of reading, this evening I found myself with that dreaded I-can’t-believe-it’s-Monday-tomorrow-I-don’t-want-to-go-to-work-you-can’t-make-me feeling. So I turned to one of my favourite pastimes and decided to journal the blues away. I love my journal. It’s my little portable creative workshop. I write in it; I doodle in it; I keep a reading log in it; I plan in it; I daydream in it; I escape in it. I put time and care and energy into making it a work of art, because that’s what I love to do. I like to make pretty things. It’s calming and satisfying and, well…me. 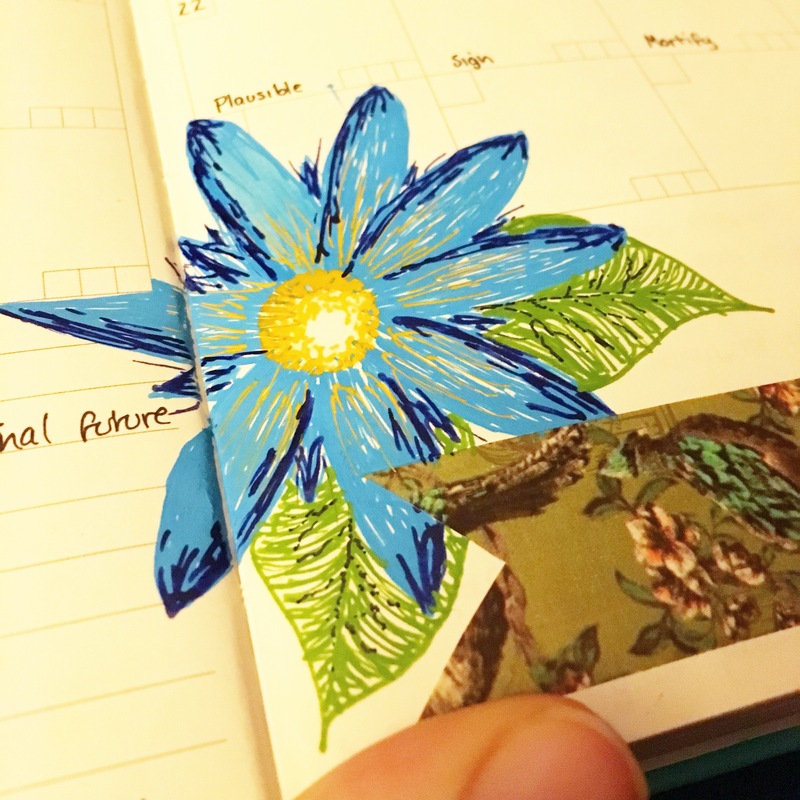 Imagine my frustration then when, in the middle of my calming-me-down, make-something-lovely journaling, I managed to somehow create a huge blue splodge, right where I absolutely did NOT want a huge blue splodge. My initial reaction contained words that shall not be repeated here for fear of them damaging sensitive eyes and turning my happy little corner of the internet into something sour. When you put time, care, and energy into something, even a tiny mistake can be upsetting, making you angry and forcing that morose little voice in your head to pipe up with: “Well that’s just friggin fabulous what is even the point? !” This was not a little mistake. This was a BIG, blue blob. Much like the Oreo that was offered to me last week by a friend to cheer me up, which, when I reached out to take it, broke in half and fell on the floor, my big blue blob felt a little like a metaphor for life right now. But wait…was I to be defeated by this blue blob? Was a two dimensional splodge of ink to undo my initial determination to shake off the Sunday blues? Would I let this intruder into my happy place get the better of me? No. No I would not. For I am WOMAN. I am FIERCE. I am ME. And I control my own happiness. So I took that big blue splodge and I bent it to my will. I turned it into something beautiful. I turned it into a flower. The one you see at the top of this page. Imperfect? Sure. But since when does beauty have to be perfect? That depressing blue blob no longer exists. Instead, there is a perpetually blooming flower. This flower symbolises the coming spring and all good things ahead. This flower symbolises the power of positive. This flower symbolises that, even though I cannot always control the things that happen to or around me, I can control my reactions to those things. And that, dear friends, is the story of how my Sunday blues became even bluer, but how I overcame them anyway. A small thing can have great power. I encourage you to embrace the power of positive. Great example! Love the flower!